It’s Spring! Well, almost. In many areas the snow is melting and the trees are budding. The grass is turning green and the flowers are blooming! The world is waking up in the beautiful sound of birds chirping and frogs croaking. All in all, Spring is a glorious time to get outside and enjoy nature with your children. It’s also a time of wrapping up the school year and fitting in a few things that may not have ‘fit’ into the schedule during the year. Perhaps you did not have a chance to focus on poetry or copywork that helps your children’s imagination come alive……. Today, I am posting over at Homeschool Mosaics. You can read the remainder of the article for tips and recommendations for Spring here. Once you have read the article and are ready for the notebooking pages, you can find and download them below. Without further delay, here are the notebooking pages for the month. Feel free to share them, print them, and enjoy them. Just went over to read your post! (the link you have here, though, brought me to a different blog, but I found it!) I love spring. I love the “new”ness, the beauty and the endless opportunities. Thank you so much for these resources. I am going to download them right now and look forward to using them with my children. Much love to you, friend! Lisa, oops! Thanks for letting me know! I was multi-tasking! I hope you enjoyed the other blog – it’s a fun one to follow!Sending hugs and love to you, too! Thanks for the reminder – just as I linked up (and went to put the link in the post) my internet crashed. I’ll have the link on in a few minutes. I need to write myself a reminder about your link up. Thank you so much for the Spring copy pages. 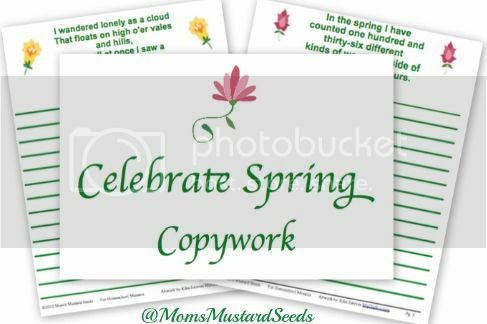 It has been cold and snowy here and we are SO READY for Spring and all of its color and newness…this will be great for the kiddos to work on!